We were fulsome in our praise of guest, Lisa Moore, the distinguished Canadian novelist, as well as the dish we prepared on this episode of One Chef One Critic Season 8. The conversation was substantial and lively, as was the Lobster Mac and Cheese. You will absolutely love this recipe. Heat oven to 400 F (200 C). In a small bowl combine the panko, butter and parmesan. Butter a 12 cup (3 L) casserole. Fry garlic in butter until golden. Stir in thyme, then whisk in flour. Slowly pour in milk while continuing to whisk, whisk, whisk. When mixture is smooth allow to cook (whisking occasionally) for 5 – 7 minutes until thickened. Stir in spices and cheeses until smooth. Now stir in the macaroni and lobster meat. 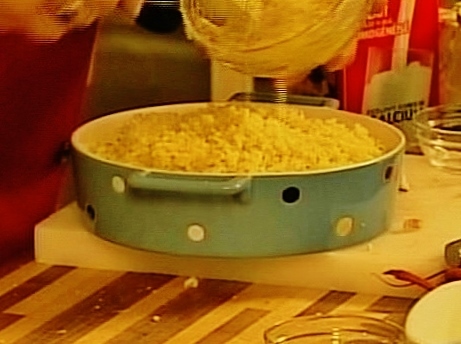 Pour the macaroni mixture into the casserole. Cover evenly with the panko and parmesan topping. Bake for 25 minutes. Remove from oven and allow to cool slightly. Serve.